One of the most important aspects of landscaping and creating a thriving garden is to maintain the upkeep of the space. Plants have special needs and can often be finicky depending on your plant choice. There are multiple basic aspects of maintenance that should be known by any person undergoing a gardening project. ic requirements that any space owner must follow. Lawn is important to keep mowed and fertilized or it will turn yellow, dry up and die. The lawn will require replacement if it is not watered regularly, and it is important to choose an appropriate length for the strength of your grass. Raking leaves is important to remove an over fertilization of the area that you wish to keep clean and green. Regular fertilization is necessary to ensure healthy and bright lawn and greenery. Pruning ensures that shrubs and plants do not overgrow and begin to lose their shape. Many shrubs will start to fall in certain places creating holes in the shrubs. In order to maintain strong and full shrubs, they must be pruned regularly. Irrigating and weeding is important to ensure that the nutrients in fertilizers and watering are being used by the plants that you wish to grow and thrive. If you do not pull the weeds, they will take many of the resources from the primary plants. Plant perennials and annuals and take note of whether they are blooming at the proper time. 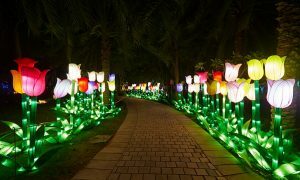 If the plants are not thriving, you may want to plant other bulbs in that area to help it flourish. Time should be spent developing the combination of aspects involved in order to create a breathtaking and beautiful green space. The creative use of plant life and features as well as functional aspects will create more success within your space.